The Mobile World Congress is coming near with every passing day. We are now getting more and more information about the devices that are going to be showcased at the event. Samsung is going to launch a new tablet, and the company already gave a hint by the teaser yesterday. The company sent out Media invites yesterday for the launch event of Samsung Galaxy Tab S3. Just as the name indicates, it is going to be the successor of Tab S2, and today, the details including specs and design have leaked. So, we now not only know what it packs inside but also know how it looks like. Starting off with the display, the Tab S3 is going to feature a 9.6-inch screen with a resolution of 2048×1536 pixels. 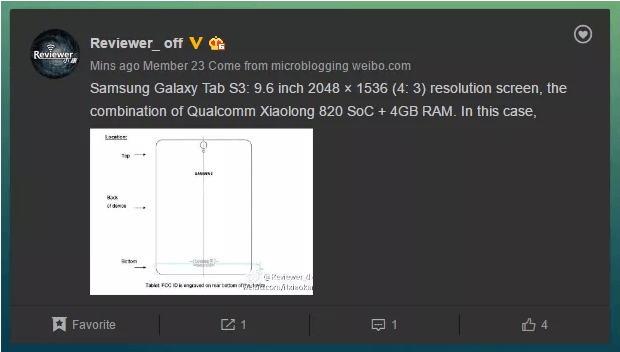 The company has kept the same ratio of 4:3 as of the Tab S2. The tablet is powered by a Snapdragon 820 chipset along with 4GB of RAM. It is worth mentioning that the RAM has been upgraded from 3GB on Tab S2 to 4GB on the Tab S3. There’s gonna be a 12MP rear and 5MP front-facing camera and the device runs on Android Nougat out of the box. Interestingly, the tablet is just 5.6mm thick which makes it a really ultra-thin tablet. Now, talking about the design, a user has leaked the image with dimensions of the device that show the rear of Tab S3. The rear camera is on extreme top and below that is the LED flash. The position of the Flash is different from that of last year’s Tab S2 as it had flash towards the one extreme side. The FCC ID is printed at the rear bottom of the device as shown in the image that gives us the hint that this is probably the real image of Samsung Galaxy Tab S3. Well, this is what we know so far about the Galaxy Tab S3, and we hope to get some more information very soon. Stay tuned as we will be updating you with every information.